If you happen to own the incredibly pricey Samsung Galaxy Note 10.1 (2014) on Verizon, get ready to throw yourself a little Kit Kat party. 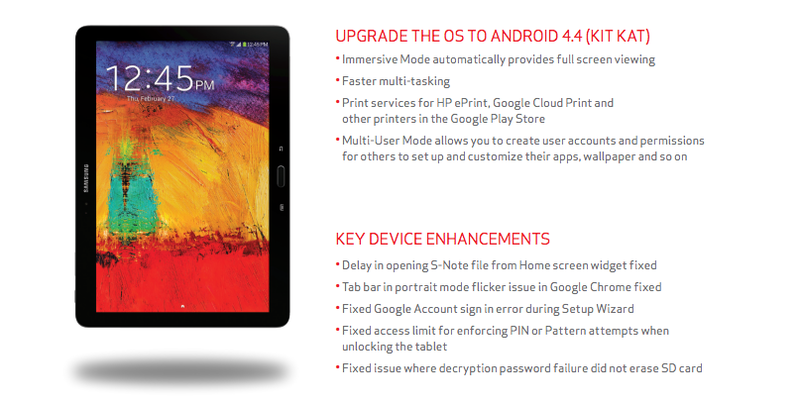 Big Red approved the update over the weekend to bring your LTE-equipped tablet up to Android 4.4.2, software version KOT49H.P605VVRUCNC2. The update includes things like Immersive Mode, faster multi-tasking, cloud print services, and a multi-user mode so that you can setup user accounts and permissions as needed. Samsung also fixed a delay in opening S-Note, a flickering issue in Chrome, the access limit for enforcing PIN or Pattern attempts, and more. Let us know if you see anything extra fun in the update.